Check new pictures of the road show 2008 here! 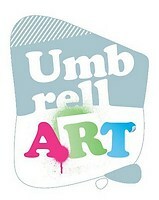 After the big show we done last October the 4th it is now time for some rest in the UmbrellART team. But we will be back in 2009! 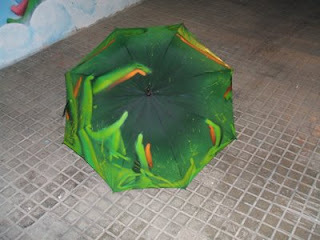 Keep making nice umbrellas and send them to us! 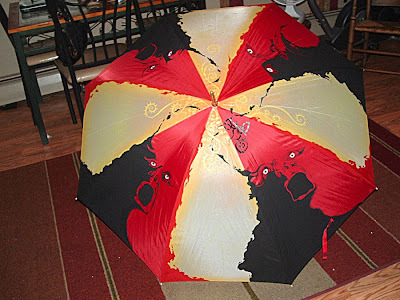 Wanna join UmbrellART? 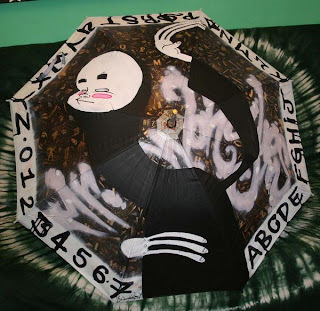 Send an e-mail to umbrellart [at] gmail.com! 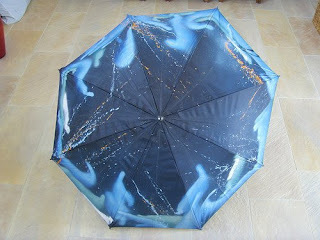 Impliva made it possible that one of the 55 umbrellas we now have in the UmbrellART collection was chosen to be one time exclusively produced. 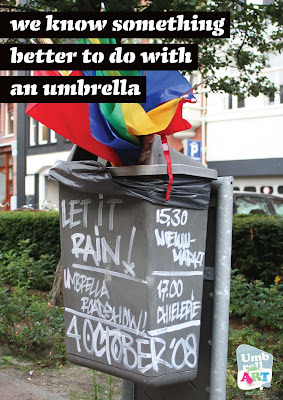 WZL (NL) won during the X Marks The Spot opening night the 4th of October in the Chiellerie the price for best umbrella chosen by Impliva. 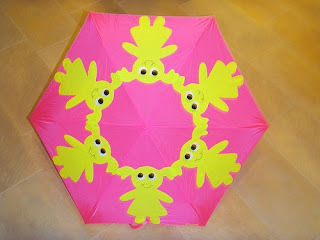 Impliva is the biggest distributor of umbrellas in Europe. And Xstreets is proud to had them as a sponsor for our latest event. 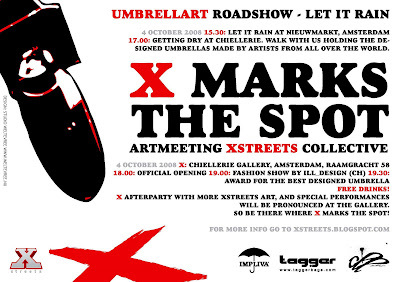 More info and pictures of X Marks The Spot, the Road show and the official party coming soon! 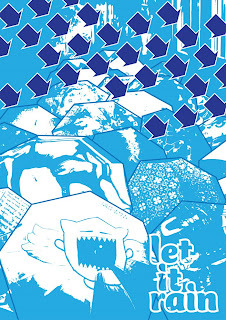 Keep also an eye on xstreets.blogspot.com! After a nice weekend trip with the crew, to SOLAR in the south of Holland with the UmbrellART show. We are home again. Here are some pictures of the weekend. We want to thank the people of SOLAR for the great time. 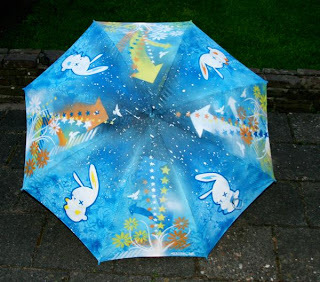 NEW UMBRELLAS FRESH FROM THE USA! 'X marks the spot' will be opened on Saturday the 4th of October at 18.00 in the Chiellerie after the road show that will be held in Amsterdam. 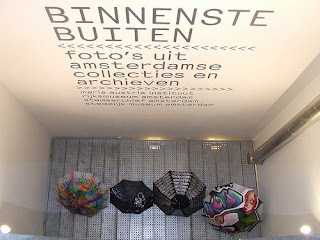 The road show starts 15.30 at Nieuwmarkt. Come and walks with us that day! 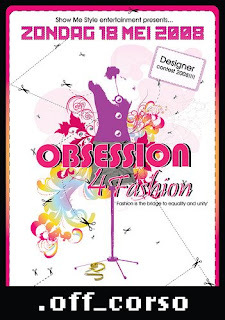 On the opening night will be a fashion show held of ILL_DESIGN from Basel, Switzerland at 19.00. There will be music by several djs and free drinks. 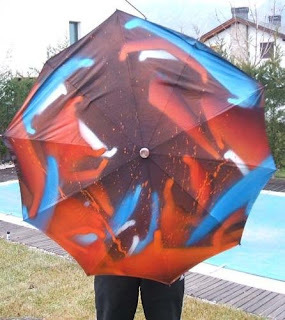 The best designed umbrella that is part of the show will be chosen at 19.30 by a professional jury and will be produced exclusively one time only for the artist. Party with Xstreets & Friends at the 'X marks the spot' official after party. The location and acts will be pronounced at the opening night in the Chiellerie. 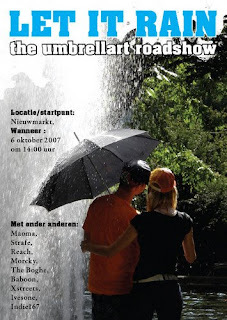 Road show UmbrellART: 4 October 15.30 at Nieuwmarkt. 'X marks the spot' opening: 4 October 2008 18.00 at Chiellerie. Duration show: 4 - 9 October 2008. Drinks: free at the opening night! 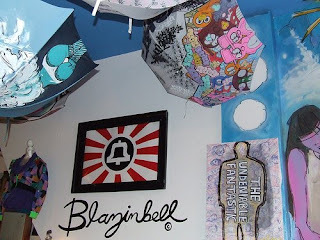 Send an e-mail to umbrellart [at] gmail.com! 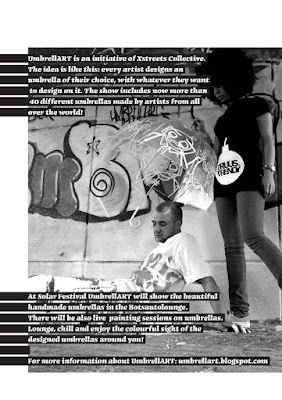 UmbrellART & Xstreets Collective live at Solar Festival this summer. 8-10th of August at Roermond. More info www.solarweekend.nl. 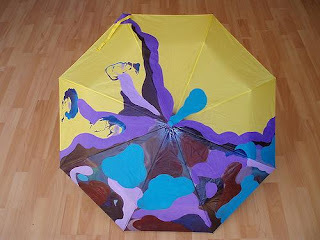 Umbrella made for UmbrellART by Liisa from Estonia. 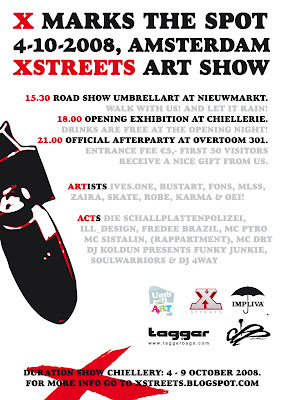 On the 4th of October Xstreets Collective and UmbrellART will open a unique Art Meeting show in the Chiellerie in Amsterdam. The opening of the gallery will be at 18:00. Everybody is invited! 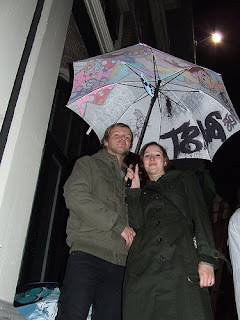 At daytime there's a new road show with the new umbrellas of 2008 on the streets of Amsterdam. More info coming soon. For more details about the show and the Chiellerie check this! Hope to see you all at the 4th of October! Watch the 4th episode of Newb TV, from the 15th minute of the video! 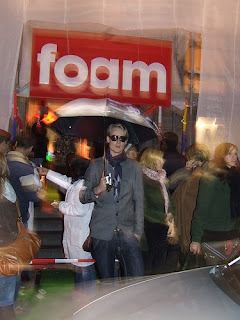 Ives is talking about UmbrellART in Winq Magazine, edition July 2008. 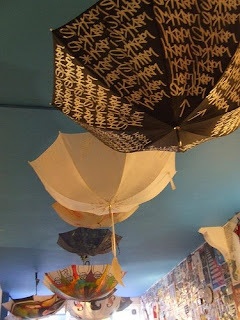 The umbrellas of UmbrellART, an initiative of Xstreets Collective, hang for three days in the Rollbar Skatelounge in Basel, Swiss. 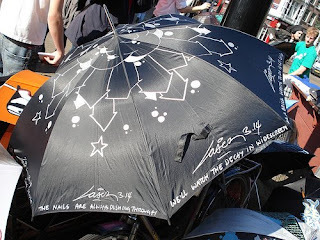 All the umbrellas from 2007 and 2008 could hang there. For pictures check flickr or myspace. And yeah also to support our national (NL) team at the European Championship and to join the Cut Out EM show organised by our friends and Xstreets Collective members in Basel. 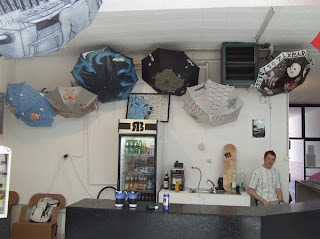 But most of all to show the wonderfull umbrellas from UmbrellART at the unique Skatelounge Roll Bar in Basel, Switzerland. 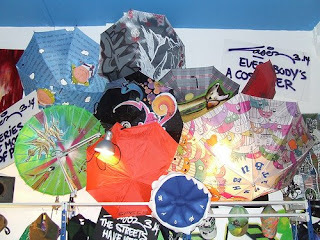 The umbrellas will hang in Rollbar the 21st of June. Several dj's will spin those records till 22.00. So, If you are in the neighbourhood... check it out! IT WAS A GREAT DAY, SATURDAY THE 24TH OF MAY 2008. 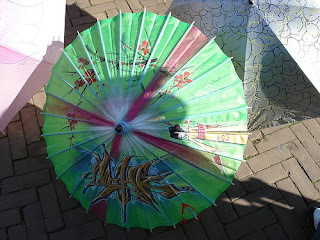 THE SUN WAS SHINING, GRAFFITI WRITERS PAINTING THE GRAFFITI TOWER AND UMBRELLART SHOWING UMBRELLAS DESIGNED BY ARTISTS FROM ALL OVER THE WORLD. 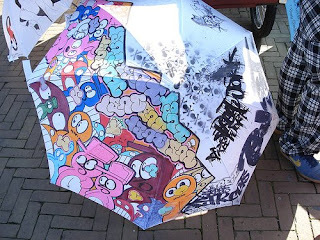 TODAY THERE WILL BE LIVE PAINTING ON UMBRELLAS AT THE 2ND AND LAST DAY OF THE FLEVOPARK FESTIVAL IN FLEVOPARK AMSTERDAM. THIS WEEKEND: SATURDAY THE 24TH AND SUNDAY THE 25TH OF MAY, THERE WILL BE A BIG FESTIVAL HELD IN FLEVOPARK. 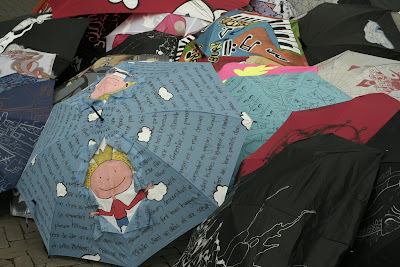 There where umbrellas everywhere! Outside, Inside on the ceilling, by the stairs and on the catwalk! 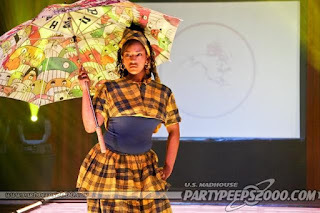 Models with traditional clothes walked with the umbrella over the catwalk. For more pictures please check www.flickr.com/photos/umbrellart or www.myspace.com/umbrellart ! Its gonna be one hell of a party, so come and crash the party with us. 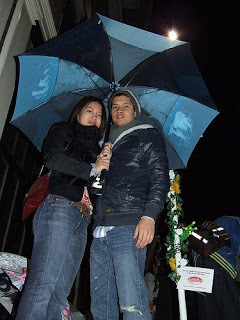 18th of may in Rotterdam in the OFF CORSO. 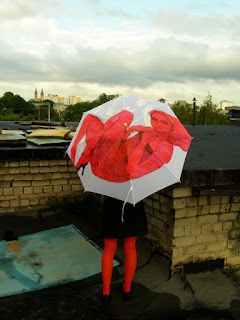 There will be a invasion of umbrella's at the catwalk show, models will show some damn great new designs and also our umbrella's. 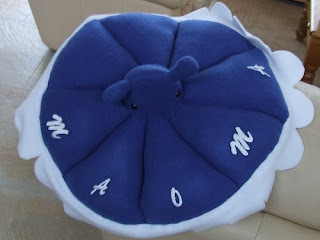 we will check you there. Just to inform you all this is the newest BLOG of XSTREETS collective. 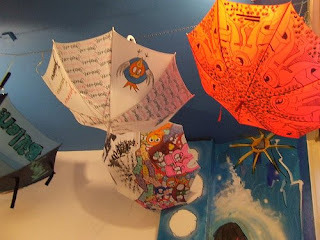 On this blog we will keep you all informed about all the news about umbrellART.